Excerpt: The process of overturning literally centuries of usage is a difficult one, but this book demonstrates that Rus’ of the eleventh and twelfth centuries was not only part of medieval Europe but, in fact, a kingdom. Furthermore, it shows the consequence that making such a seemingly small change will have on our modern interpretation of what medieval Europe looks like. However, making such an enormous change is difficult, and requires stepping through discussion of titles, language, and the study of the Middle Ages. However, at the end, the result will be a newly expanded medieval Europe, without an ahistorical line dividing it into East and West. Excerpt: This book purports to be a ‘history of Scotland’ until AD 900. It is therefore the history of a country that did not exist. No one living in the territory we now call Scotland during this period would have identified the territory by that name, nor as any single nation. It was an area occupied by many different tribes and nations, all changing constantly. Throughout these centuries, such groups came into existence and disappeared, sometimes independent of each other, sometimes subject to one another, sometimes at war and sometimes in alliance. Excerpt: One of the most interesting aspects of Italian Renaissance murder is the extent to which it cane be seen to foreshadow contemporary twenty-first-century murder. Or to phase it in another way, we are interested in whatever is distinctive about murder in the culturally specific time and place of Renaissance Italy, but also in how closely aspects of murder in Renaissance Italy and twenty-first century Europe and America are aligned. So, while trying to analyse what was new and distinctive about murder then, we also try to see what new twists have evolved – indeed what new types of murder have emerged – in the 500-year gap between the periods, in order to shed light on the paradox with which we opened this introduction: murder is simultaneously time specific and yet has a core that is chronologically free floating. Excerpt: The first question posed in the Muqaddima is why do historians make mistakes? Three things lead to error in writing history. First, partisanship. Secondly, gullibility. Thirdly, ignorance of what is intrinsically possible. It was this third issue that first and foremost he sought to address, since earlier chroniclers had not given any serious consideration to the general laws that govern the formation and dissolution of human societies. They had not studied the batin (the interior meaning) of history, but were only compilers of the zahir (the essentials). Ibn Khaldun scrutinized accounts of past events and sought to assess them on the grounds of plausibility. One needed to take account of cause and effect, then how things work when the situations are similar, and then how things work when the situations are dissimilar. Excerpt: These selections from the work of Caroline M. Barron offer insights into two pathways of a long and distinguished career. 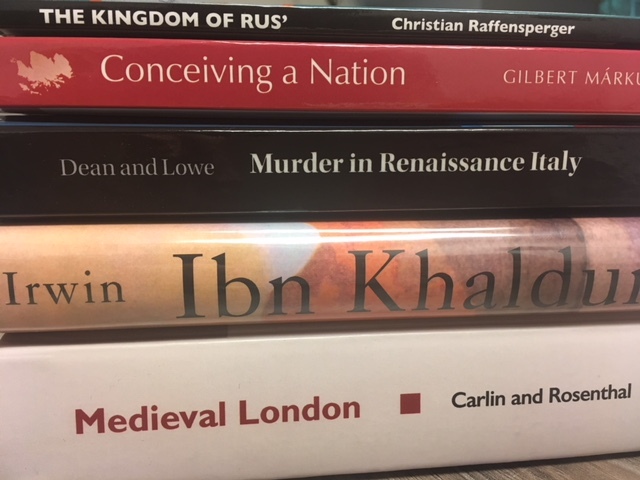 One pathway, of course, is her detailed examination of many aspects of the history of London in the later Middle Ages. The great metropolis of the British Isles – a superb case study for urban life in northwestern Europe in its many forms and varieties and with a very rich body of extant record materials – has been Professor Barron’s main focus since she began to offer learned and insightful contributions to this field in the late 1960s.